At some point in our lives, many of us will find ourselves on a slowly deflating blow-up mattress, resting our sleepy heads on musty smelling pillows, swaddled in a questionably clean sleeping bag, wondering if a spider is going to crawl into our ear after we nod off. I am of course talking about camping which, if I’m honest, is not my most favourite thing. There are several downsides, which I’ll illustrate here to help those of you that are toying with the idea of taking up this recreational activity, to understand what you’re in for. Ablutions. The communal ablution is the first item on the list. This is a place where everyone gathers to wash off the grit from the day in camp. It’s usually one of two things; a block of bricks or a timber framed hut. If you’re smart, you’ve chosen a camp site far enough away from this structure so as not to get a whiff of the goings in inside, but close enough so that you can make the journey there on foot without having to stop along the way to answer the call of nature in a more natural setting – say next to someone else’s tent. The showers in these ablution facilities, however clean they may be, are excellent locations for picking up a case of athletes foot if you’re ignorant enough to venture into them without the universally accepted and required apparel – the flip-flop. They also always seem to have been plumbed together by a self-taught handy-man who, upon completion of the job, found that at least two buckets needed to be placed somewhere along the mysterious and usually superfluous piping that seems to have come straight out of a Mario Brothers game. There also always seems to be some confusion about which tap (or side of the mixer in the more posh camp sites) will produce hot water. It seems that adopting standards and following commonly held conventions are always the first things to go when doing your own plumbing. Hot side, cold side, meh. Shade. The very thing that we as a species have pursued on hot days since before we evolved opposable thumbs, is another camping issue. There simply is never enough of it. There will almost always be trees on your site, but they will usually be too small to camp under which means that you will either be slow roasted to the point that you abandon your tent in the mornings before breakfast, or you will risk suffocation in the afternoon sun as all the air is sucked from the surface of the planet. You won’t be able to avoid both. At midday you will be sitting in your car with the air conditioner running, watching dead grass and insects melt outside your window. Smoke. Camping by definition is open fires. These are the touchstone of camping and if we’re honest, the main reason we partake in this strange activity is the oppertunity it affords us to sit around a campfire and watch things burn. Whether it be wood, food or stray flying insects that burst into flame as if by magic having mistakenly flown a little too close to the flames. But the problem is that it’s not just you. There are all those other pyromaniacs camping out there with you, each of whom is intent on keeping their fires going throughout the night, like the stokers of the fires of hades. What this means is the campsite is awash with the smoke of a hundred fires. Not. So. Awesome. Abhorrent things. 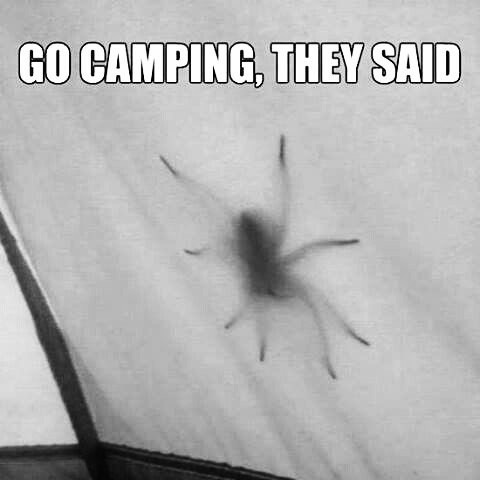 The rule of thumb here is that if it has more that four legs, it’s probably a crawling nightmare of some kind that you will more than likely find glued to the inside of the roof or your tent the moment you switch off the light. If it has less than two legs it’s probably a snake or a worm and let’s be clear, neither of these things is something we would willing spend a night in a sleeping bag with if we had a vote of influence in the matter. It is also fair to say that all of these things are far more at home in the boondocks than people are and are drawn to our warm bodies like rats to the pied piper. Our bodies play the song of warmth, of civilization, of soap, of fear, of come slither into my shoe – that is completely irresistible to these creatures of the underworld. Sleep. Yes, we go camping to sleep under the stars but we don’t really sleep under the stars do we? We sleep under flame retardant, waterproof, breathable tent fabric that smells like old fires and feet. We sleep surrounded by people that snore and fart like bears hibernating with full stomachs. The silence of the great outdoors is not so silent really. It’s punctuated by the sounds of inflatable mattresses being re-inflated at thirty minute intervals throughout the night. That, alternating with the sound of mosquitoes feasting on your extremities and your children and flapping around your head incessantly for hours on end after they’ve had their fill, out of pure spite alone. Those are just the highlights though, there’s also hours of packing and unpacking and then more packing and unpacking and you will inevitably leave something important at home, like the long spear that you would have used to kill the ghoul in your shoe with more eyes and legs than any creature should be allowed to have. On the plus side though, children seem to love it. It seems to make them feel like extras in a Huckleberry Finn adventure and the goal of any parent worth their salt is to make their children happy, so there is that. And, there’s the marshmallow factor. That passtime of roasting puffs of sugar on sticks over an open flame. That makes up for quite a bit, I must confess. Quite a bit. This entry was posted on Sunday, July 16th, 2017 at 23:52	and tagged with Ablution Block, Blog, Camping, Children, Flip-Flow, Kitchen Sink, Marshmellows, Parenting and posted in Offspring Musings. You can follow any responses to this entry through the RSS 2.0 feed.